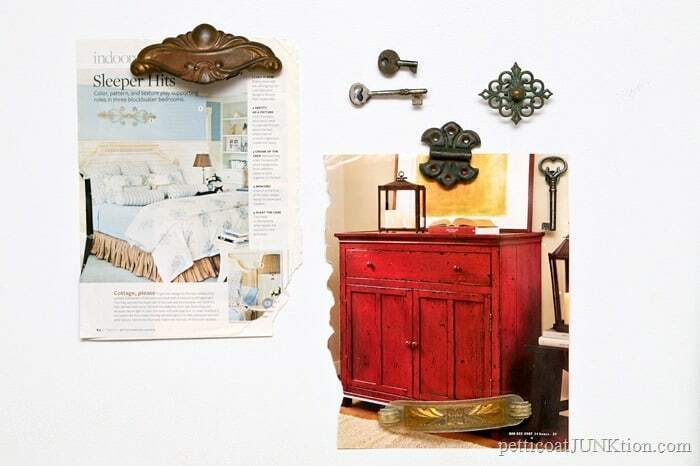 You can make antique key refrigerator magnets in 10 minutes or less. I went through my stash of antique keys and put together the refrigerator magnets. The project took no more than 10 minutes and I had all this free time so I went on the hunt for more stuff. A short time later I had magnets made from vintage hardware. The magnets have character and are real beauties.They certainly stand out next to my freebie advertising magnets and travel/tourist trap magnets. Another project that makes me smile. 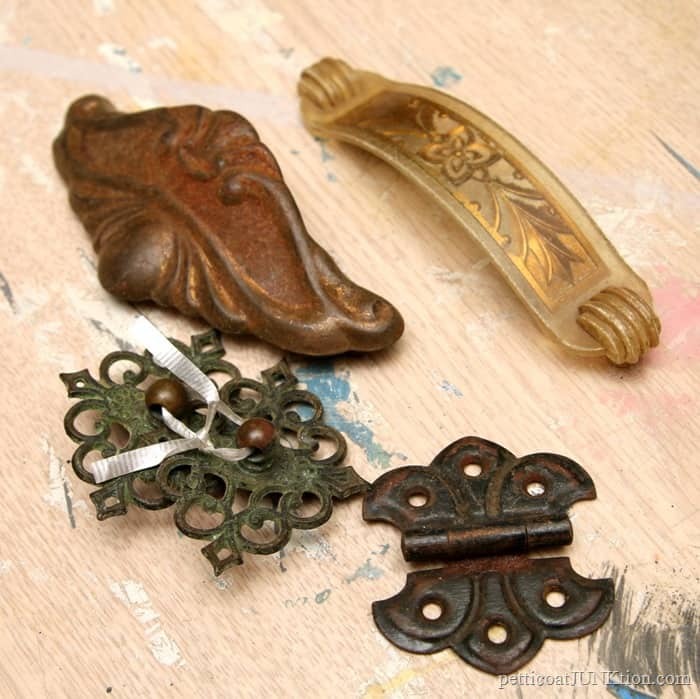 I would hate to see these vintage and antique pieces end up in the metal recycling bin. There are so many things you can do with these pieces. 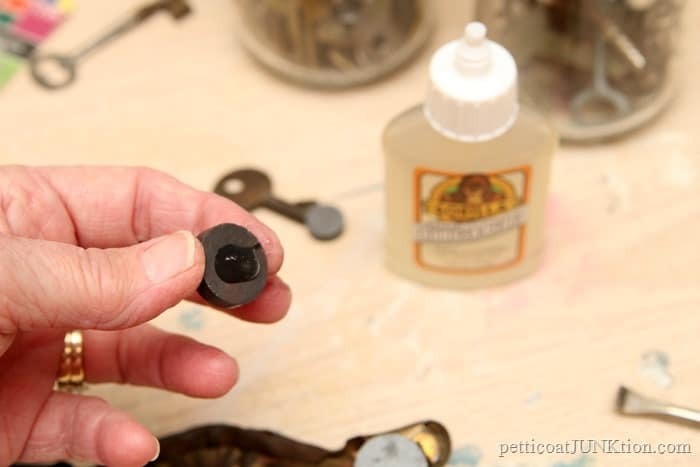 Some people make angel tree ornaments using the antique keys. The long hardware pull is my own unique take on refrigerator magnets. The furniture pull has a magnet on each end. Usually there is one magnet glued to a small decorative item. I can’t do anything the regular way. 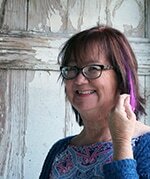 Today is Thrift Store Decor Day and we are welcoming a new blogger on the tour, Pam from House of Hawthornes. My thrifty friends always have a unique take on their budget creations. Links to their posts are listed after my magnet tutorial. I have two jars of keys. One jar is mainly junk keys and the other holds vintage keys. 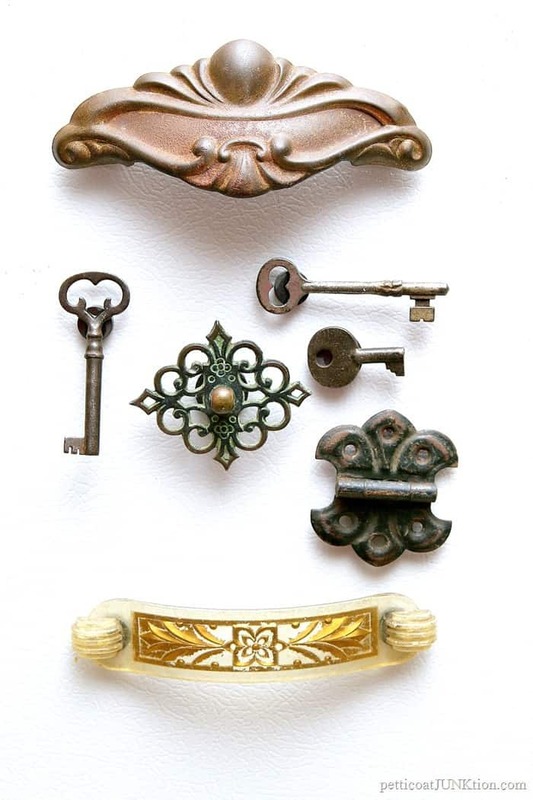 I pulled out 3 of my favorite vintage keys to work with. I noticed the vintage keys are attracted to the magnets but the newer keys aren’t. Different composition. These are the pulls and junk things from my hardware stash. As I mentioned earlier I liked the idea of using the long furniture pulls for magnets. First thing I did was polish the hardware with Howard’s wax. 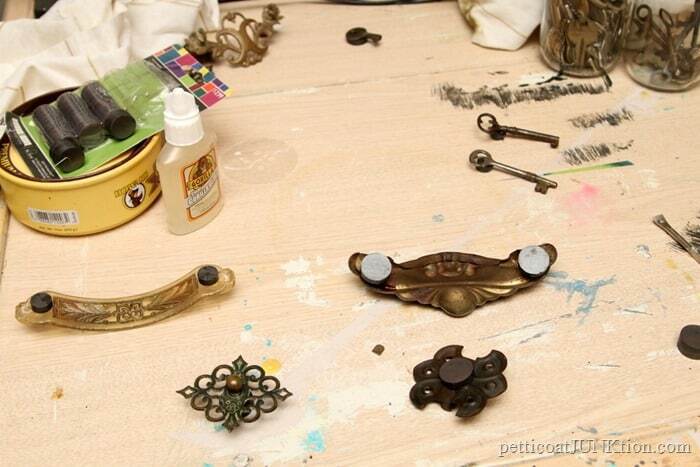 Some of the pieces were a little rusty and the wax keeps the rust from rubbing off on stuff. I use Howard’s Wax on just about everything. 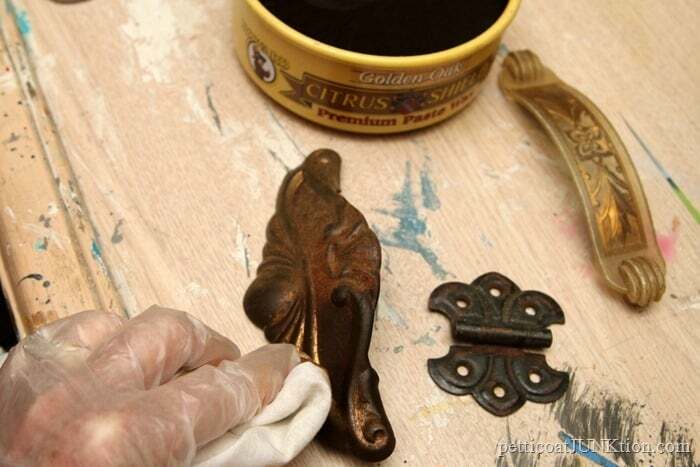 It’s great for antiquing painted furniture, bringing wood mirrors back to life, softening leather, etc. I have a package of magnets I bought at Hobby Lobby and I also have some that came from the thrift store. 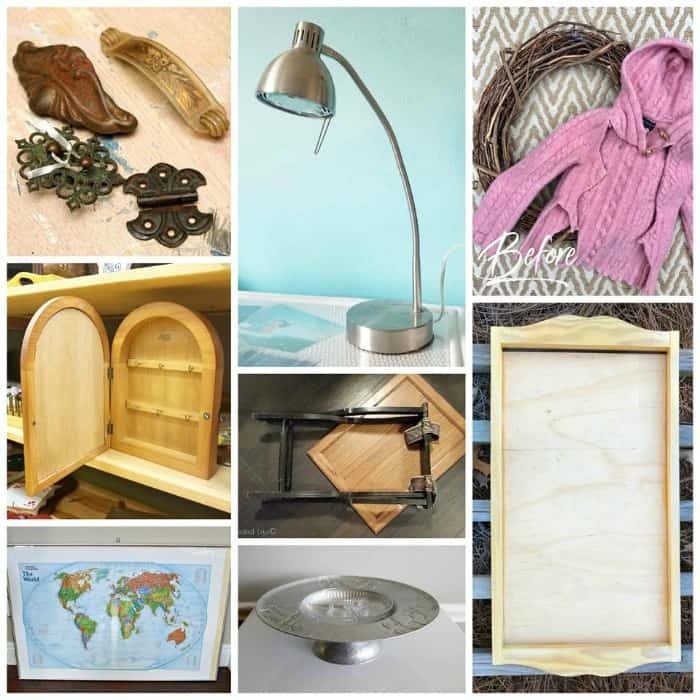 Always check out the small stuff (usually in bags hanging on hooks) at the thrift store. Magnets are pricy. I used clear Gorilla Glue to stick the magnets to the hardware. Not sure how long it takes the glue to dry. I let the magnets sit over night. Notice how I have all the hardware and magnets separated? Put those darn things too close together and they all hug on each other. Not good until the glue dries! Now see, isn’t the long hardware pull cool as a magnet. I wasn’t sure how to best stage the magnets so I just pulled out my folder of inspiration pages torn from magazines and stuck them on the fridge. 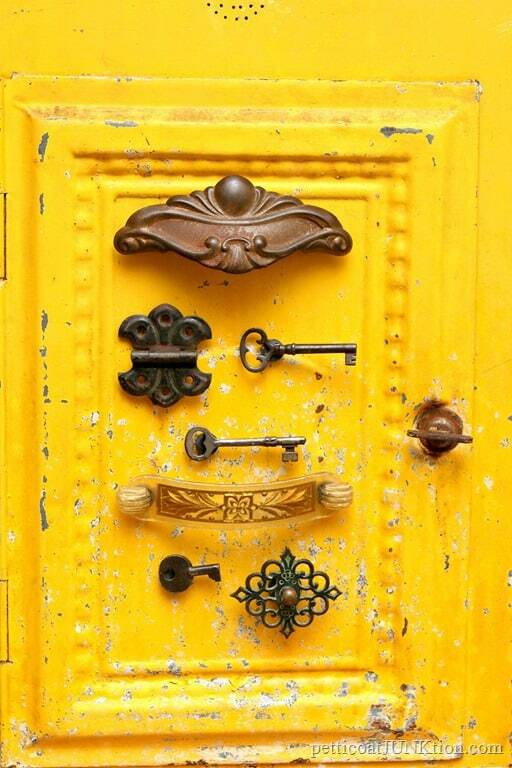 The antique keys and vintage hardware magnets are more like art than magnets. I did a good job. Can you see me patting myself on the back. I’m eating a piece of chocolate too. I stuck the magnets on my yellow antique pie safe. They sure pop against the bright yellow. As you can see the pieces will make there way around the house. There are all kinds of things I can stick them on. Which magnet is your favorite? Do you like them? Are you digging through your junk drawer yet? My favorites are…..all of them…I can’t pick just one. Great idea! Just wrote this down in my craft idea notebook. Love all of your magnets, so clever! I love the character than these magnets have especially on your pie safe; my fridge is already covered in STUFF. 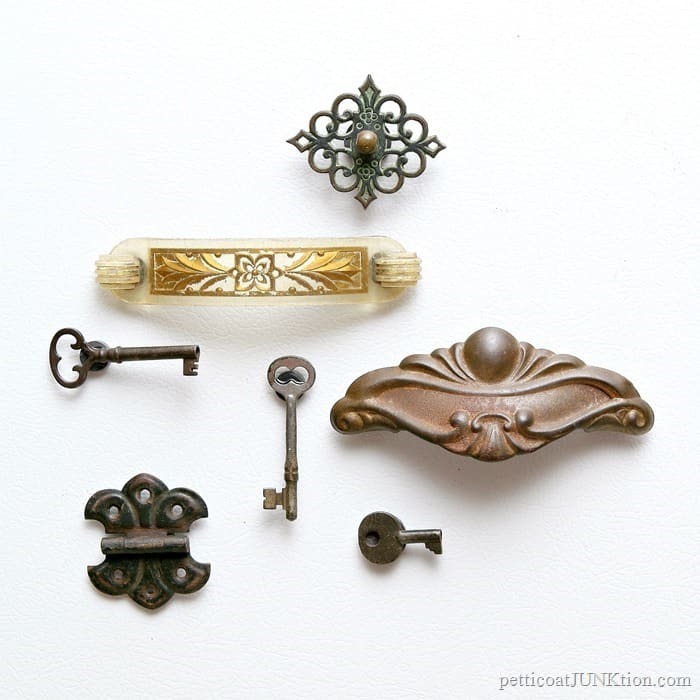 I like the idea of buttons (or old earrings, too). One place I found to use a few magnets is on the back of my medicine cabinet doors (lists of poisonous plants, how to do CPR, medication info), This Christmas bazaar at church, I put magnets for sale on the metal post supporting the floor joists! 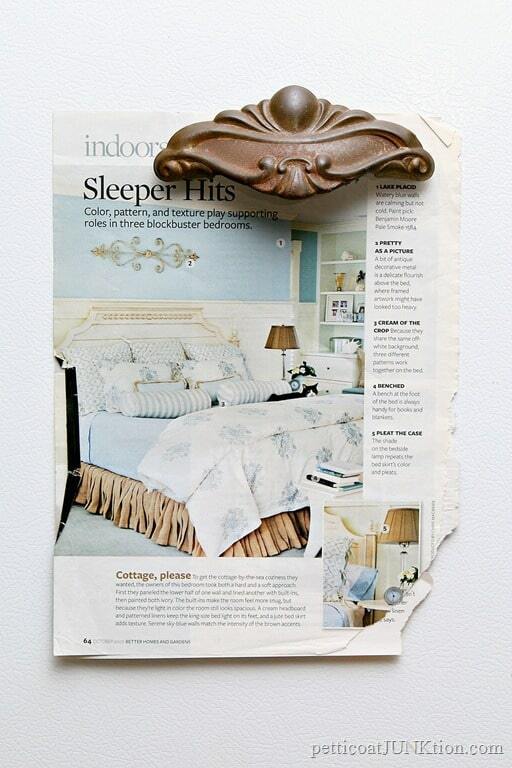 There’s a lot of places that could use a little adornment! Great idea! Love the look of them, especially the larger one. You’re so clever. I love the keys! All of them are beautiful! 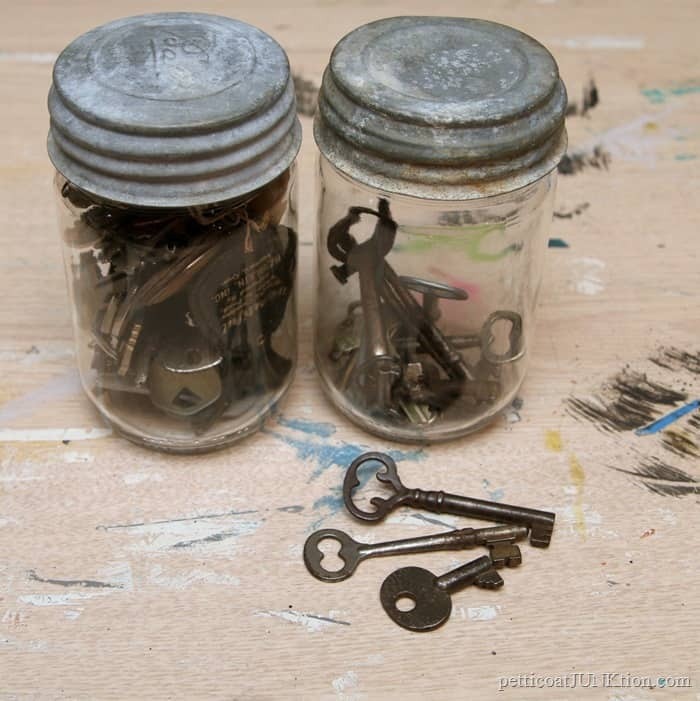 Can I say that I just love the fact that you have two key jars!!! Great project! Your magnets have such lovely shapes. These are gorgeous! What a cool idea!!! 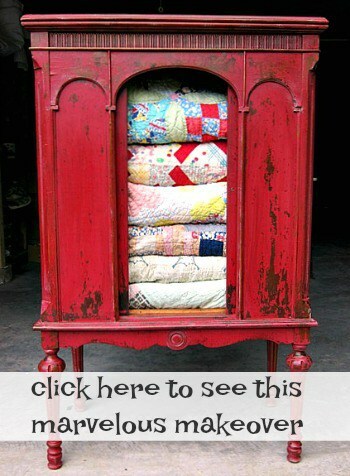 I need to keep my eyes open for magnets at thrift stores – Love it!!! What a wonderful idea!! 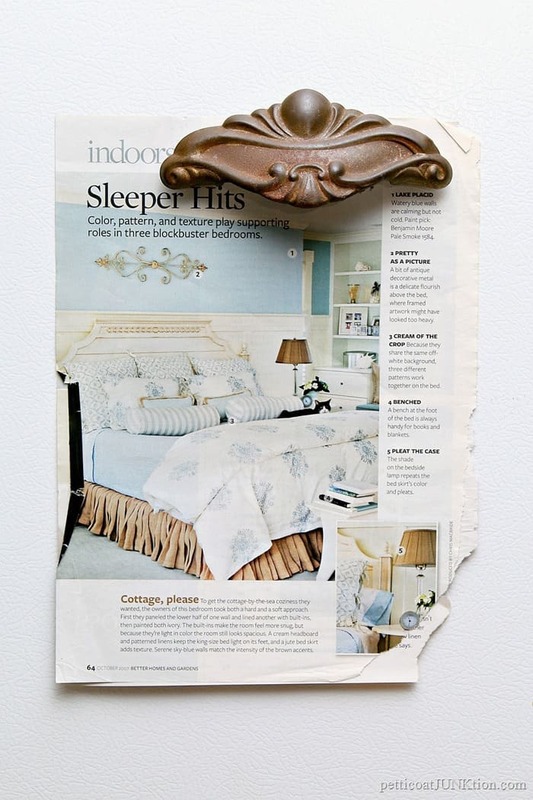 I have a huge stash of leftover craft magnets that I had no idea how to use them up, now I do!!! Very clever idea! Oh how clever! Love how they look…going to raid my junk stash today! Now this is awesome, I need to go get some magnets! Thanks for the idea. I love the long magnets the most! Great idea. 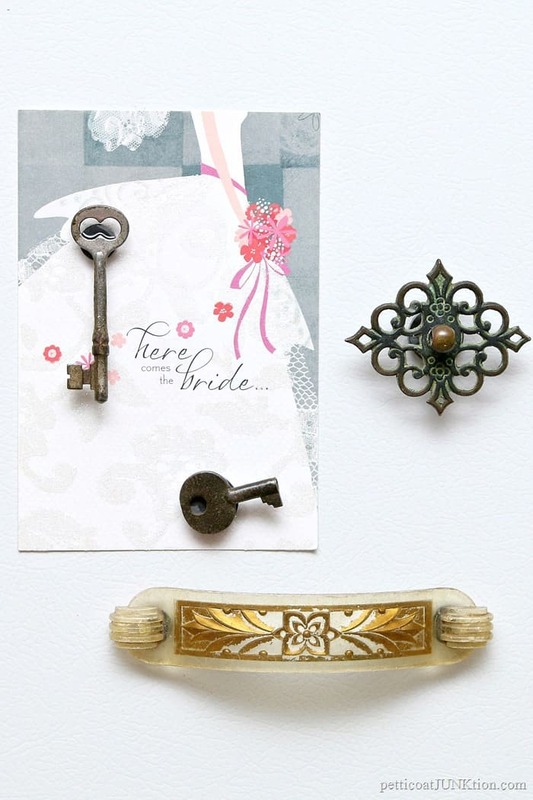 I have used beautiful old buttons to make both magnets and push pins. Noe l will have to be on the lookout for old hardware! I never would of thought of buttons! I have a jar of old buttons. Thanks for the idea! I have soooo many pieces of hardware that this would be good for! Brilliant my friend. You’re a master of junk Kathy!! This is so clever! I never thought of this. Really jazz up the fridge. 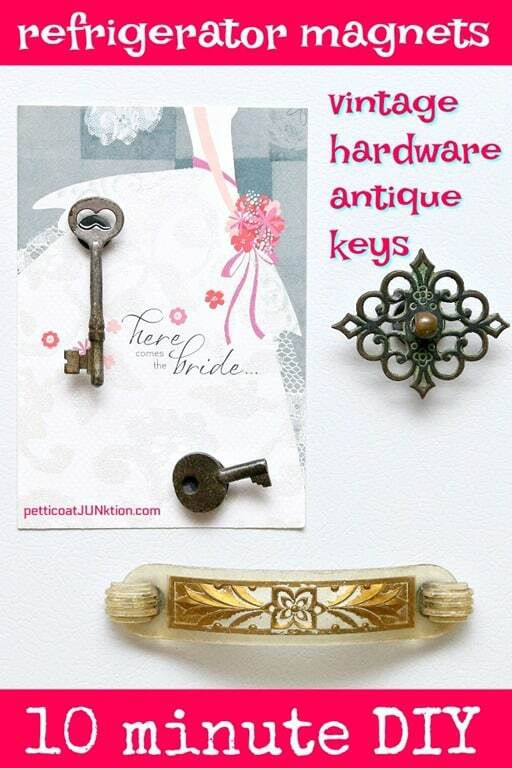 I adore these and wish I had a junk pile of old keys and hardware to select from to make my own. But, alas, I do not,I will just have to admire yours.